and is eager to learn. They do best with gentle training methods, done with rewards, firmness, patience and consistency. They seem to thrive in an environment where they are challenged. They are a well rounded breed who love to play but can be just as content to lay at your feet. Activity: AussieDoodles require exercise and mental stimulation to thrive. They will do well in an apartment provided that their needs are sufficiently met. AussieDoodles can live happily on a farm or a big city. They excel in agility and are often used as service or therapy dogs. The Aussiedoodle with be most happy with daily walks and playtime. Coat Type: AussieDoodles coats come in a range of types, from wavy to curly. Grooming needs vary depending on coat type, with brushing for a wavy coat to professional clipping for curly haired dogs. Tails may be full (usually carried up with a curl) or they may be docked. 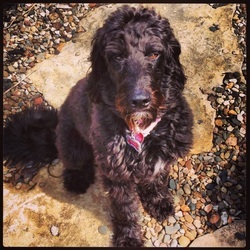 Size: The Aussiedoodle can vary in size depending upon the size of the poodle breed used in the mix. However, they generally range from 10-25 inches shoulder height and can weigh between 15-65 pounds.